"I would like for someone to say that they're sorry for killing my family." Lionsgate Premiere has released a trailer for a film titled Aftermath, about the lives of two people intertwined after an airplane accident. Arnold Schwarzenegger plays a father who struggles with grief after his wife and daughter are killed in a plane crash. Scoot McNairy plays an air traffic controller who makes an error that leads to the accident. The cast includes Maggie Grace, Kevin Zegers, Hannah Ware, Glenn Morshower, and Mariana Klaveno. In addition, Darren Aronofsky is listed as a producer on the film, along with his co-producing partner Scott Franklin. This looks quite solid, even though it seems like such a sad story for everyone in this. Two strangers’ lives become inextricably bound together after a devastating plane crash. 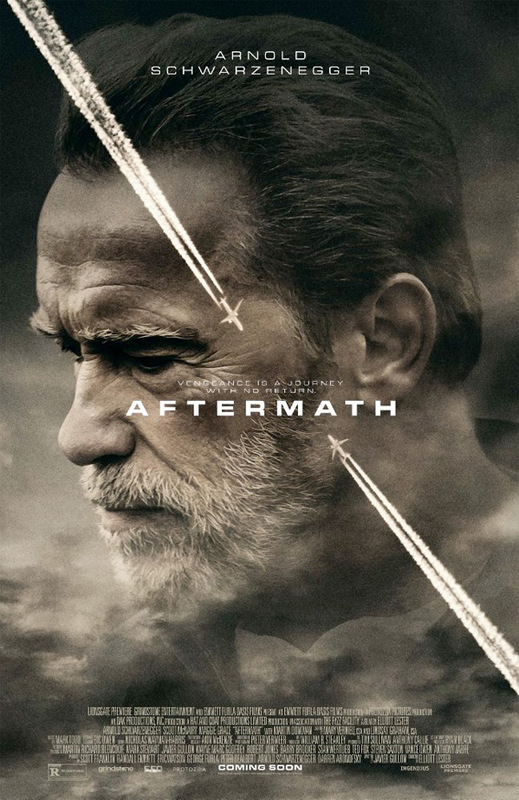 Inspired by actual events, Aftermath tells a story of guilt and revenge after an air traffic controller's (Scoot McNairy) error causes the death of a construction foreman's (Arnold Schwarzenegger) wife and daughter. The film features Arnold Schwarzenegger (Terminator Genisys, The Expendables 3), Scoot McNairy (Our Brand Is Crisis, 12 Years A Slave), and Maggie Grace (The Taken Series, Lockout). Aftermath is directed by English filmmaker Elliott Lester of Blitz, Nightingale, and Love Is the Drug previously. The screenplay is written by Javier Gullón. Lionsgate Premiere will release Aftermath in select theaters starting April 7th. Curious? I thought Arnold was going in a different direction. Those awful commercials he does for that smartphone app is awful and reeks of schilling. Well, it is a true story. Arnold's a better actor when he doesn't talk. The accent kills his performance for me...I just...can't take him seriously. Where's all the shooting and explosions and cheesy one liners?! ?